One of the other main ideas behind our republican system is a robust system of checks and balances. So, theoretically, if any of the people elected get out of hand, there should be other people perfectly placed to put a stop to it: no insurrection by the citizens necessary. I am a ‘big picture’ kind of guy. I like fundamentals. I inspect foundations. I don’t live in the present moment, carried along by the latest mass-media inspired ‘hate du jour‘ which are presented as having no history, no source, and no roots. In fact, I think roots are pretty important. We debate the ‘fruits’ of things, but pay no attention to the branches. If we did, we’d follow the problem all the way back to the trunk, and from there to the roots, and understand that unless the whole thing is pulled up, your disputations and rage are ultimately for nothing. You may have delayed the inevitable, but the tree will grow back again, in another generation, and threaten to bear fruit yet again. It is with great interest, then, that I have watched the controversy regarding Donald Trump unfold in Republican circles, but not as a manifestation of 2016 politics, as though 2016 was the first year humans have ever existed, or the first year the United States has elected a president. My Facebook feed is thoroughly populated with people who despise and detest Donald Trump. I mean, they really hate him. I’m talking about conservatives, here. In the main, they pull for Cruz. In the main, they are Christians. And, for the record, and to immunize myself from the vitriol of the aforementioned Facebook friends, I myself support Cruz. (And I am a Christian). But, I have to wonder why it is that we’re so worried about Trump. I wonder if, in worrying about Trump, we are accepting a premise that is far more sinister than Trump. Let’s consider some of the concerns that have been raised about Trump. 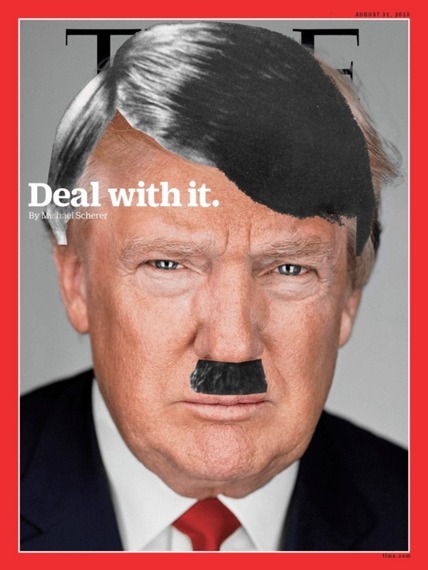 There is, of course, the concern that he is like Hitler. This probably has as much to do with the populist appeal that Trump has. There is the concern that Trump will move unilaterally to… well, do anything and everything. Examples: Ban Islamic immigration, make Mexico pay for a wall, get rid of the EPA, etc. Some of us are concerned that despite his assertions to the contrary, he would fund Planned Parenthood. Now, this last is of some interest, and feeds into the point that I’m making in this post. Aren’t you a little interested in exactly how a President can fund… anything? As it happens, a lot of the people who have the long knives out for Trump on funding Planned Parenthood actually funded Planned Parenthood. Like, only 3 months ago. They may have voted for the legislation that came later, that would have defunded Planned Parenthood but was vetoed by Obama… but then, they knew that the latter would be vetoed but the former would not. Net effect: Planned Parenthood is funded for another year. unilaterally get rid of Federal agencies? unilaterally act on immigration issues? unilaterally revise the tax code? In the first four cases, if the point isn’t obvious by now, the president only has the power that is given to him BY CONGRESS. Very little to show for it. The CONGRESS has had the ability for six years to put a stop to unilateral executive action, whether through legislation or by exercising the power of the purse, and they’ve pretty much just let Obama get away with everything he wanted. No one wants to have a showdown. No one wants to put their money where their mouth is… except folks like Cruz, who is hated and despised by people in his own party… for having a showdown and putting his money where his mouth is. I mentioned the last item, the confiscation of guns, to highlight another aspect of the question. Let’s assume that Trump really moved to unilaterally confiscate guns. Do we imagine in this scenario that Trump begins going door to door, compelling homeowners to turn over their ‘automatic’ weapons? If they resist, Trump straps on his SWAT gear and goes Rambo on them? No. To enforce such a thing he would need the compliance and active support of municipalities and law enforcement. Thus, by issuing our concern about a fascist Donald Trump as president, are we not doing two things at once? 1., Are we accepting the premise that our presidents get to be fascist if they want? Is the only thing that separates whether or not we live in a tyranny or the ‘land of the free’ the whims of a particular president? Should it really be possible that a president can make or break a country, all by himself? Should a country’s economy and prosperity hinge on the power and authority of a single man? Or even 535 men and women (House and Senate), plus 9 for SCOTUS, and another 1 for the president for a total of 545 men and women reigning supreme over a population of 300,000,000? My friends, if our life, liberty, and well-being, hinges on the whims and will of less than a thousand people, it is stupid to be arguing over the respective characters of those people and what they will or will not do. The problem is much more foundational: Even 1,000 elected Hitlers should be relatively harmless, if the checks and balances established by the Constitution were in place. 2., Are we voicing our concern that the mass of America’s people will simply go along with something just because the president, Congress, or SCOTUS, declares it? To confiscate America’s guns would require America’s army to carry out the collection. Are we saying that, deep down, we think that our soldiers would follow unlawful orders? Are we saying that our state governments will comply with plainly unconstitutional rulings by SCOTUS? That our governors and state elected officials will not stand up to Federal overreach? Well, if you think the concerns expressed in #2 are legit, I wouldn’t argue with you. I think those concerns are valid. But they are the fruit, not the root. To get to the ‘root’ we have to go back to a time before most of us were born, at least as far back as Woodrow Wilson and Theodore Roosevelt, if not further than that. And, frankly, Republicans have been complicit. If we live in a time where a president of the United States could actually be a tyrant… and there is ample evidence already that we have long reached this point… then our problem is not any particular candidate for president. The very foundations of the republic have been eroded. Elect Donald Trump or don’t elect Donald Trump. The mere fact that you think he could actually destroy the country means we have bigger fish to fry. No one wants to have a showdown? What about the government shutdowns over these exact issues? Oooh, are you going to be a regular reader? I’m excited. With that: What government shutdowns? Did any ever occur? If any did, which parts of the government, if any, actually shut down? No insurrection by the citizens necessary. Sweet! Guess you can hand back your guns then! The mere fact that you think he could actually destroy the country means we have bigger fish to fry. Hasn’t Obama destroyed the country? Or at least had a really good crack at it? Isn’t the president the Commander in Chief of the armed forces? But, I have to wonder why it is that we’re so worried about Trump. John Oliver can probably help you there. But the framers of the Constitution knew that was a big, BIG ‘if.’ So, as a last resort, the insurrection may be necessary. It’s all there in the Declaration of Independence. An armed populace is the final ‘check and balance’ available. I don’t know my Australian history well enough to say for sure, but I would wager to guess that before there was a ‘Stolen Generation’ there was a ‘Mass Disarmament of the Aboriginals.’ I know in the US, the Cherokee were disarmed before they were force-marched out of their home. In Canada, the aboriginals were likewise disarmed. Meaning, if he arbitrarily commands a soldier to do something, it is automatically a lawful order? Meaning, Trump could very easily wreak a lot of havoc. But your analogy is false, anyway. You’re talking about the subjugation of an incumbent population by people who want to replace them. Not the subjugation of an incumbent population by the members of that population, via a government they elected. Because if we think the whole governing apparatus is just going to do whatever any particular president decrees, we have much more serious problems than any particular president. FYI, I’m not saying that people who have this fear have it irrationally. I think it is legitimate, but, being legitimate, it means that the republic has crumbled… it is a republic in name only. No it isn’t. It has multiple applications. The principle applies wherever there is tyranny: before the tyrant can tyrannize, the people he means to tyrannize must be made incapable of fighting back. But this does speak to the present situation, in that people have been electing people year after year after year after year who have sold them down the river. The American idea was ‘no taxation without representation.’ But what if the people you elect to represent you, don’t? Its absurd to think that counts as being represented, just because they were elected. And if the people elected turn around and subjugate the population, it does not at all follow that the elected people had this right, or that the population approves of it. The US population manifestly does NOT approve of it. Hence back to back to back sweeps by ‘Tea Party’ conservatives, and now, with the failure even of these to turn the tide in Washington, even Cruz can’t convince. Trump is perceived as completely outside the system, and that’s what people want. Insofar as people are afraid that Trump can do a lot of damage, that in my opinion speaks to the more sinister problem that the Executive Branch has that power in the first place. The more power you give someone to ‘help’ you, the more power they have to ‘hurt’ you. We don’t always get to choose who that ‘someone’ is going to be… so the saner course is to give that person very limited powers with significant checks and balances. That was how the country was founded. It is not how the country now stands. If the Presidency wasn’t operated more like an elected-dictatorship than a restricted-executive, people would have a lot less reason to be ‘anxious’ about Trump being President. Of course I just take this as further proof that progressives in either party don’t have a problem with unchecked systems of government as much as they are concerned with just who particularly runs them. But then, it was the fact that not every politician would have an upstanding character that was the reason the Founders set up those very same checks progressives tore down in the first place. So hang on… do you think Trump can do a lot of damage, or not?